The Canadian indie rock band Young Rival is famous for creative non-standard music videos to their songs. For example, the video on the song “Two reasons” shows different people vividly mimicking with fancifully painted bodies and faces. Their new song “Elevator” (though released in 2015) has got its music video only now due to special production conditions—the video was done on a dot matrix printer. 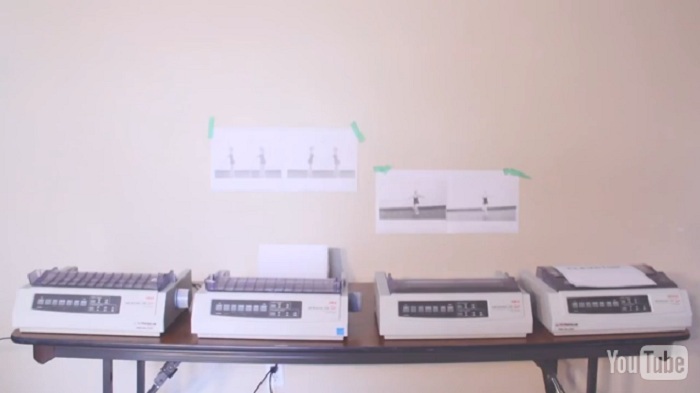 According to the music video director John Smith (who is the Young Rival bassist as well), to complete the task, they have used 4 Oki Data Turboline 320 dot matrix printers—first three were used gadgets bought on ebay and the last one—the whole brand new—all of them were shown in the first seconds of the video. The process itself was rather difficult because of the print speed (about 30 images at a time) and jams when the printer was left unsupervised. But the producers still have managed to print every frame of a digital video, to scan them all back and to make a bound music image. The reason why this idea has been implemented is the nostalgia for good old days when to have your own dot matrix printer at home was beyond best expectations. The producers have left the jammed frames and included them into the video (which has worked out to be vintage to match the special sound of the “Elevator”). One big advantage of the process they name is the price—about $40-50 on 6-7 ink ribbons throughout the entire project. This entry was posted on Tuesday, January 3rd, 2017 at 7:56 am	and is filed under matrix, printer. "4 New Exceptionally Stylish Canon Pixma All-in-ones"
"Australian Recycling Center Turns Old PCs And Peripherals Into 3D Printers"